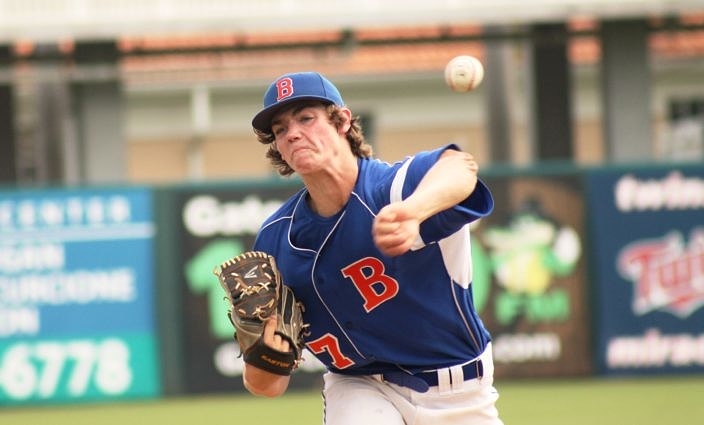 Hunter Barco went the distance on the mound to lead Bolles to the 2-1 victory on Wednesday. With the winning run on base and Pompano Beach threatening to change their future, the Bolles Bulldogs answered with a nice defensive play to close out the game. 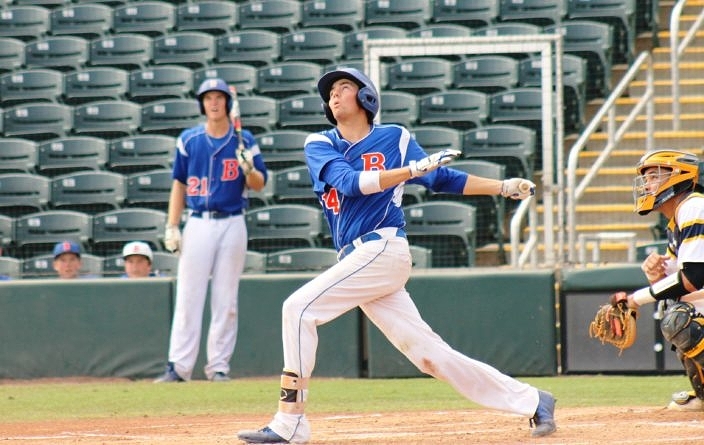 Second baseman Max Ferguson raced in, scooped a roller up the middle and gunned it to first base for the final out, as Bolles held on for a 2-1 victory over Pompano Beach in Wednesday’s 5A state semifinal at Hammond Stadium in Fort Myers. The Bulldogs (20-10) advanced back to the 5A title game intent on defending their state crown. Bolles will attempt to make it two in-a-row Thursday afternoon against Bishop Moore, after the Hornets advanced with a 9-0 win over Lemon Bay in Wednesday’s other 5A semifinal. Bolles will be competing for its eighth state championship in program history. Max Ferguson helped get his team going in the top of the first inning with a lead-off single to center field. Austin Knight followed with a double to left field for two runners in scoring position and immediate pressure on Pompano starter Trevor Kniskern. 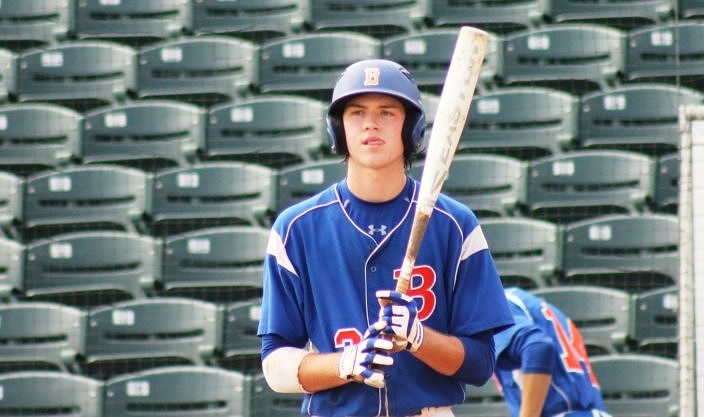 Brendan O’Neil got a grounder to the right side for an RBI groundout that plated Ferguson to put Bolles on the board, and starter Hunter Barco followed with an RBI double that drove in the deciding run. Kniskern dug in from there and was dominant the rest of the way, even despite great approaches by the Bulldog hitters. After facing six batters in the first, the junior right-hander faced the minimum 18 batters over the final six frames to keep the Tornadoes (24-4) in the fight. Austin Knight connects for a double in the top of the first inning for Bolles. The Pompano Beach defense made play after play behind its ace as well. Fielders chased opportunities all over the diamond, sliding and diving with absolute abandon to get the ball in the glove. Center fielder Mike Schuler had the play of the day when he dove out and was airborne to snare a hard liner to center and rob a potential hit from Ferguson leading off the sixth. Tornadoes first baseman Jake Nord also came up with several nice plays. He slid along the sideline clay to snag a pop foul in the fifth and then scooped a low bouncer along the right sideline and flipped to Niskern covering first base for a key out in the seventh. Matt Stephenson made a nice grab and putout for the first out of the seventh and Ryan Hiott made a sliding grab on a fly ball in the second. Pompano Beach responded to cut the deficit in half with its only run in the bottom of the second. Chase Costello was hit by a pitch and Austin Carney then jumped on the first pitch he saw and laced it deep into the left field corner, sending both runners racing around the bases as Carney reached with an RBI triple that made it a 2-1 ball game. Max Ferguson got it started with a single and a run in the first, and also recorded the final putout of the game. Bolles responded with a 6-2 putout to get the lead runner at the plate on a fielder’s choice from Stephenson, while also getting a swinging strikeout and catching a player attempting to steal to escape the threat with the lead intact. Each side’s starters dug in from there, as base runners were limited the rest of the way. Pompano second baseman Christopher Ajello led off the fourth with a double to deep left field, but was stranded as Barco induced an infield ground out, followed by two strikeouts. Both pitchers went the distance on the mound. Barco scattered four hits and hit three batters, while striking out five to earn the victory. Kniskern allowed three hits and one walk, and he recorded seven strikeouts. Pitching with a lead before his first throw helped Barco settle in and relax quickly. Bolles comes up big to make the final out and wins 2-1 to return to the state championship! Bolles manager Mike Boswell comments on his team's big win in the 5A state semifinal.